Smiling Hogshead Ranch is producing a three day event including performances, workshops and dance parties. 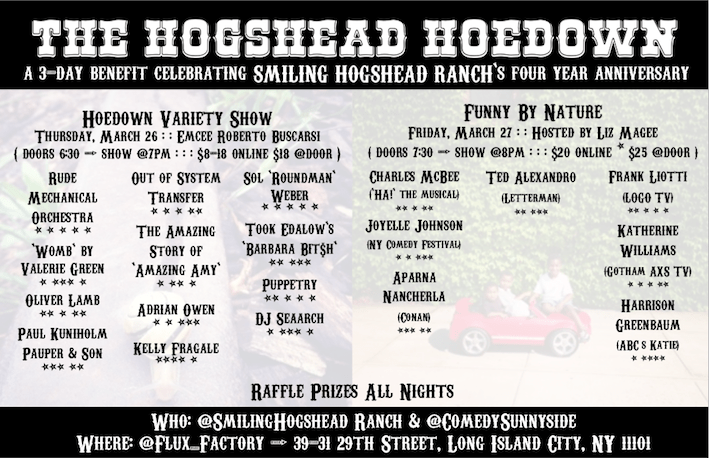 This Hogshead Hoedown is a benefit for the Ranch and will provide learning opportunities, spotlight local talent, serve as outreach to potential members, and raise funds to promote urban agriculture in Western Queens and beyond. 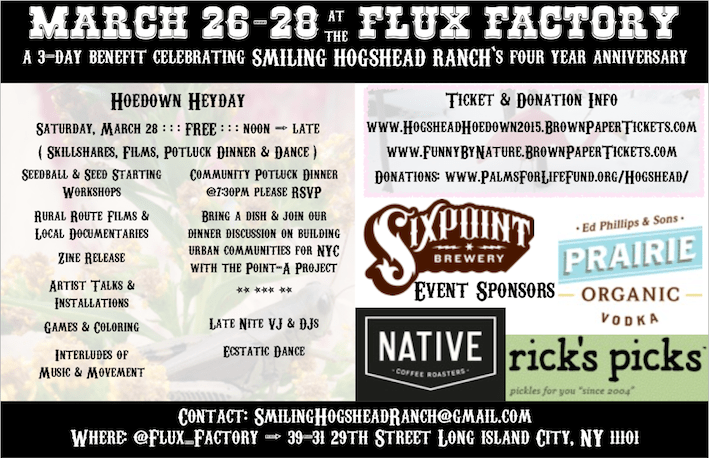 Smiling Hogshead Ranch is collaborating with the Flux Factory to host three days of events, including a variety show (6:30pm, Thursday, 3/26), a comedy night (7:30pm, Friday, 3/27) and a full day of skillshares, films, a community potluck dinner and late night dance party (1pm till late, Saturday, 3/28). The Hoedown kicks off on Thursday with a variety show curated by Hogshead co-founder and community organizing resident at Flux Factory, Gil Lopez, with emcee Roberto Buscarsi. Tickets are $8-$18 online, $20 at the door. Events on Saturday are free and open to the public. The day will feature films and skillshares punctuated with interludes of music and movement. The day will be capped off with conversation over a community potluck dinner (starts at 7:30, space is limited, please RSVP to SmilingHogsheadRanch@gmail.com) followed by a toast to four years of cultivating community. The day will end with late night DJ sets. Artwork from Hogshead members will be on display during all events. These include the Ranch’s recently published zine “The Feed” and features artists including Caetlynn Booth, Smiling Hogshead Ranch’s artist-in-residence; Dee Dee Maucher of MoS Collective, prints from the Beehive Design Collective, and installations by Jennie Pea and Gil Lopez. Come to one event or all three, but do not miss the opportunity to support this lively grassroots organization, and to meet Smiling Hogshead Ranch members to learn about opportunities for participation and collaboration! Some participants can volunteer during events to have entry fees waived. Email event organizers at SmilingHogsheadRanch[at]gmail[dot]com if you are interested in volunteering. Elizabeth Larison is an interdisciplinary artist and sometimes-curator exploring overlaps of aesthetic and public engagement. Related interests include: political access and political facade; cross-sections of technology and humanity; practices of identity and recognition; and epistemological interrogations. She is based in Long Island City, NY.